Once again, another fake video, another false captions and another attempt to fool the people. By now we are aware how the fake posts are taking us for ride. So it is very important to keep our eyes and ears and the most important “our common sense” open. Now Let’s have a look at the videos below. Listen to all of them carefully. The language is different in all. The date on videos are different. States are different. One video has been projected with different captions and audios. Very smartly few mischief people have done adjustment to video, audio and the captions. The sensitive kind of people just react to it and start sharing to show their part of protest to such posts. Unfortunately they are sharing the fake and they dont even realize if it is real or fake. After watching all the videos shared below, one can be sure that the viral video claiming to be a mock funeral of Modi in Pakistan is very much fake. Published by Garima Times on 30 August 2017. Hear the audio carefully. It says “mar gaya Khattar hai hai”. These words are used in viral video. Published by Network 20 on 25 January 2017. Here the caption is different but audio is not very clear but no one looks like from Pakistan. There are no caps on head as Pakistan people wear and no one is seen with Kurta pajama which is the attire normally Pakistan males wear, as a result we can be sure again that this is not from Pakistan. The video is same but the audio is different. This is the audio that can be heard in viral video. This is Published by Nakkheeran TV on 20th January 2017. Its Jallikattu protest by angry people of Tamil Nadu. Language is Tamil. This is the actual video that is being circulated in 2018 with false captions and changed audio. 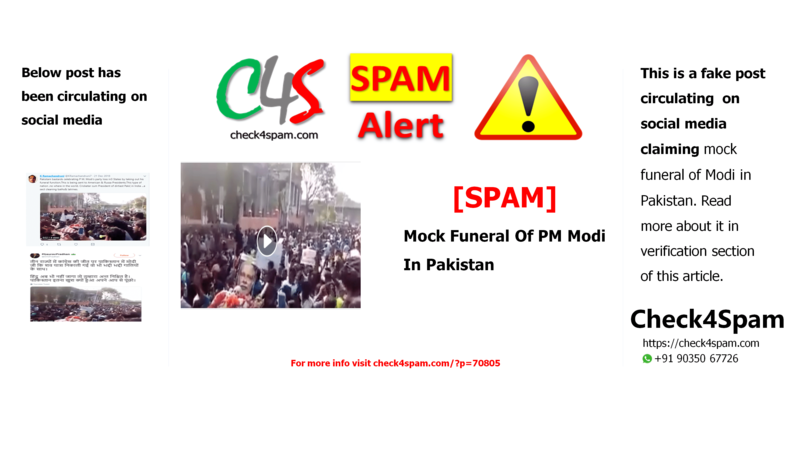 Now listen to the viral video with the caption ” Mock Funeral Of Modi In Pakistan”. It is very clear that this is a fake post. Be aware and dont get fooled. While we tell you about facts, let us also share some interesting information about Jallikattu.